30 hours program/5 days/6 hours a day/9am-4pm. Do this ONLY during your first week. Later weeks you can do standard classes. 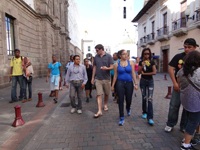 Conbine your Spanish classes with tourist activities to reinforce your language skills. $210 is for 30 hours program, $17 cable car, $8 Intinan museum, $12 Equator, $10 lunch, $17 Gayasamin museum , $21 all transportation during the week, refreshments and fees during the visits - TOTAL $295. Other sites that you can choose for your program instead the ones suggested by us. - The changing of the guard in the presidential palace. Only on Monday, 11 am. - La Ronda, a colonial street in the old town. Here you can have a coffee and rest. There are very nice restaurants. 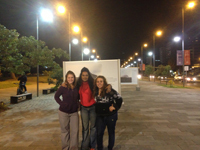 - Plaza Foch, area of ​​national and foreign visitors with good restaurants and hotels around. It is also a place of concentration of the people when there are public spectacles com the international futbo, important national holidays, cultural activities and more. - The Cable Car starts at 9am and can take up to 5 hours if you want to ride a bit .. It takes a sunny day. - The local market of Santa Clara to try a typical Ecuadorian meal. It is a traditional and popular market. - The craft market of "La Mariscal" is an important place to buy some small souvenirs for your friends in your country. - The Botanical Garden of "Parque La Carolina". If you like to enjoy nature, walk or make ice cream, this is a good place. 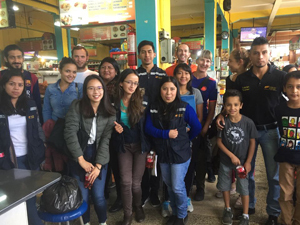 - The "Central Market" if you like the traditional fish of Quito "Corvinas" you should go there with friends. - The museum "del penal" The old prison of Quito. In the old town. It is an interesting experience "The midnight express" sensation in Ecuador The giant "Parque La Carolina". Safe area for walking and doing free sports such as soccer, tennis, basketball, boating, etc.